Evolution or Revolution? - The new Air Arms 510-Extra puts the question to you. Take the tried and true 410-ERB (Extra high power) multi-shot rifle and add a walnut right handed stock and the result is a great new look on a fantastic gun. 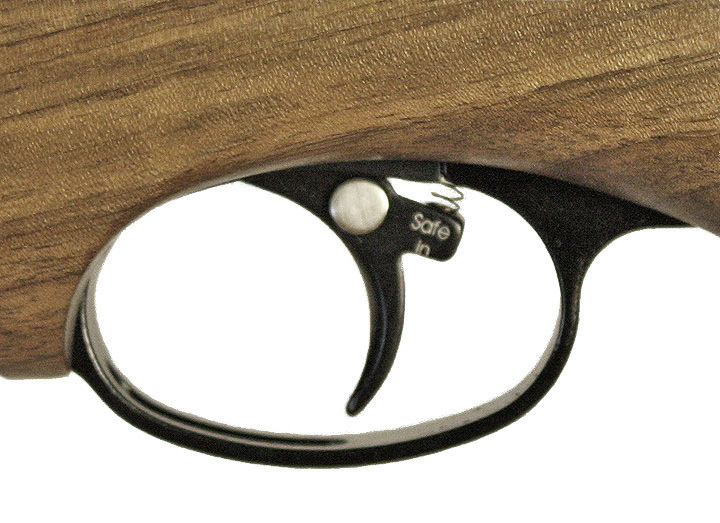 The S510 Super Lite is available as an right handed walnut .177, .22 or .25 caliber PCP (pre-charged pneumatic) airgun. A simple but effective manual safety on the trigger blade provides that little extra safety and comfort needed when working in the field. 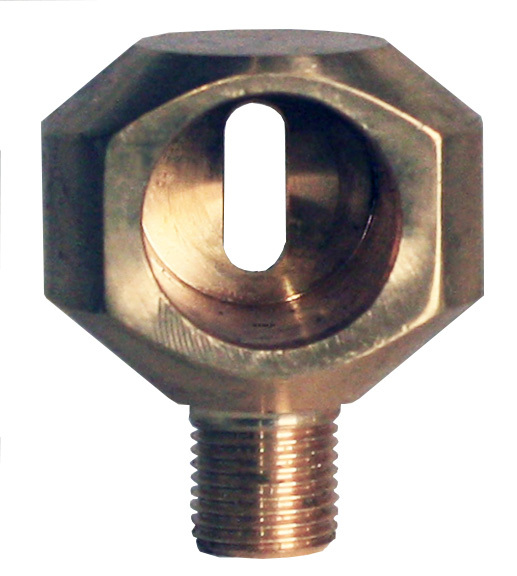 The new model also includes the Side Cocking Lever and a barrel shroud as well as the latest in filling ports. The fill port incorporates a built-in stainless steel air filter to help reduce the small particles that clog so many air rifle valve systems. The external rheostat style power adjustment knob allows you to precisely set your power level so you can fine tune your own rifle based on your specific needs. Add all these features together and you have what is sure to become one of the most sought after air rifles today.
. 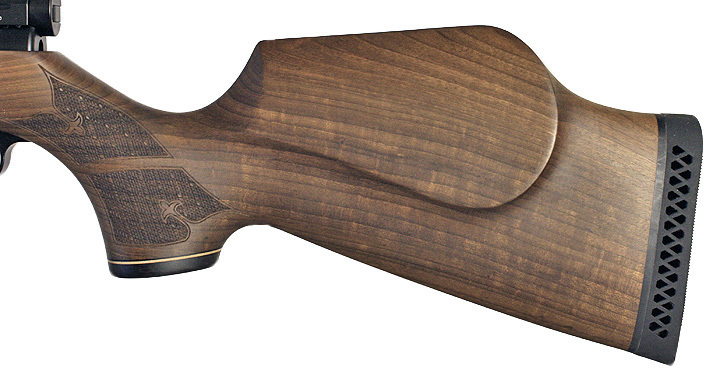 Right Handed Walnut stock with beautiful checkering on neck, forearm and under forearm. This rifle is equal to PCP's anywhere. All in all, this is a serious PCP for people interested in getting the biggest bang for their buck and the latest in new features as well. And let's not forget that the 510 Extra adds just that little extra power that serious shooters look for in a quality airgun. We found the gun's new stock to be well balanced as well as beautiful. Check this model out, folks. We think you'll like what you'll see. This rifle will continue the Air Arms reputation as a favorite rifle of shooters everywhere. The S510 Extra is a very impressive gun to shoot. It has loads of power but is rather deceptive because it is so quiet. The S510 Extra uses a shrouded and slightly longer barrel to quiet the noise and it sure does that well. This is a gun that shoots at 30 fpe (ft. lbs.) but only makes roughly as much noise as a Beeman R7. That is an amazing feat and makes the gun immensely popular. One's first impression is that the gun can't possibly be shooting at full power because of its quiet report. But one look at the chronograph results dispels that notion very quickly. 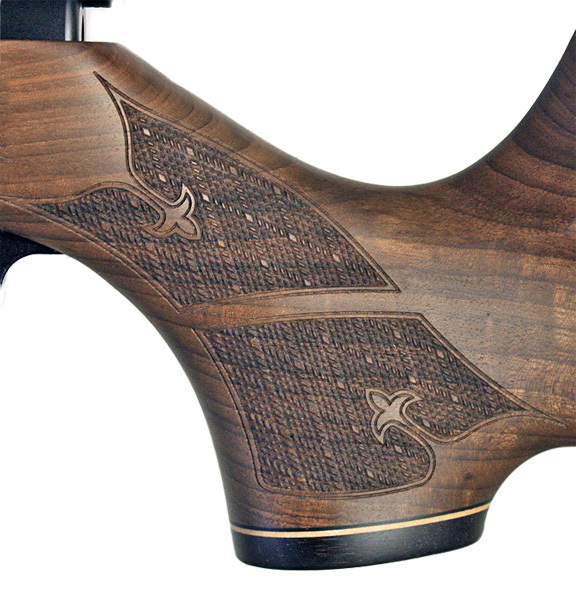 The Air Arms S510 Extra has a great looking poplar stock, good blueing and adjustable power. The rotary power setting wheel allows for very precise power control letting you set your rifle for low power indoor shooting to full power outdoor hunting. The S510 Extra's quiet shooting report coupled with the super velocity levels make this a gun that is hard to pass by. And if that isn't enough, we gave it 5's in all categories because of it's ability to "do it all" from plinking to hunting. I think you'll find this to be a wonderfully attractive gun and it will definitely tweak your "airgunitis" bug. 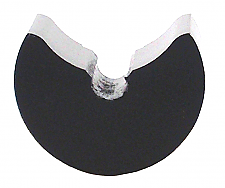 Special Note: You may notice that only domed/round-headed pellets were used in our velocity tests for PCP air guns. While conducting velocity tests on PCP's we noticed guns with magazines tend to load easier with the domed/round-headed pellets than any other style. Digging a little deeper we also discovered many manufactures recommend round headed pellets for their PCP's because they are easier (less wear and tear) on breech o-rings and magazine o-rings. Because of this we only test the domed/round-headed pellets and will only recommend those pellets as well. Break down of number of shots using a 3,000 psi fill and JSB Exact .177 8.4 grain pellets. Predators do not fit the S510 Extra magazine. Use them with the S500 Extra Single Shot version only. Break down of number of shots using a 3,000 psi fill and JSB Exact .22 pellets at Full Power. Break down of number of shots using a 3,000 psi fill and JSB Exact King .25 pellets at Full Power. Bought this gun about 6 wks. ago and it is a pleasure to shoot and it very rarely misses. Advantages: Plenty of shots on a fill. Disadvantages: Safety could be somewhere else but I can live with it.